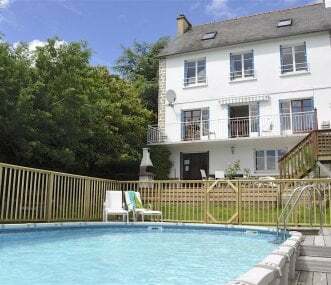 Two lovely stone cottages sleeping 14 with private heated pool. Close to all amenities, Lake Guerledan, 40 mins to coast. WiFi, trampoline, table tennis and boules court. In the heart of South Brittany countryside situated in extensive grounds, with covered heated pool, tennis court, private forest & lake. Sandy beaches and golf courses a short drive away. Sleeps 30.